A campaign group making environmental changes. Making the switch from car to bus. We have a company mission to work with clients who ‘do good things’, and Greener Journeys is a great example of a campaign group which is making big changes. Greener Journeys is a campaign to encourage fewer car journeys and more trips by bus and coach. We have worked with them since 2012 and have built them 2 websites during that time. Greener Journeys has been through various incarnations throughout it's history. Originally an environmental and 'public-facing' campaign, they later found they had more impact when campaigning government and stakeholders directly. They now produce reports and research publication into the benefits of bus travel, and the campaign is primarily directed towards key decision makers within government and industry. 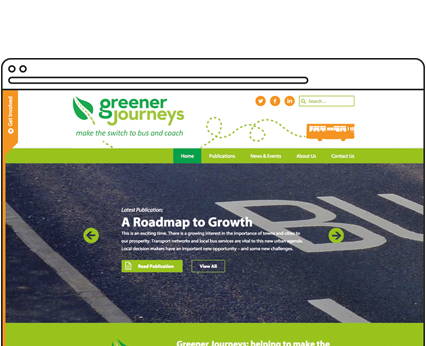 In early 2015 Greener Journeys' CEO Claire Haigh asked us to redesign their website, as the needs and purpose of the campaign group’s online presence had changed. Greener Journeys had begun producing several publications each month, and so the team required a more engaging and functional way for users to discover and access the documents. They also wanted to improve the way that users moved around the website and discovered new content. We worked with Greener Journeys to re-evaluate the goals and focus of the website. We created a much simpler and easy-to-navigate structure, with a focus on clean user experience routes through the site. The website is now a user-friendly hub for all activity and news regarding the UK bus industry. We also developed a much cleaner responsive web design, which works very smoothly across all size devices. It was essential that the site be fully mobile-optimised, because many of Greener Journeys visitors access the site whilst at events, presentations and conferences. In November 2016, Greener Journeys won the prestigious Gold Award for Sustained Marketing Excellence from the UK Bus Awards. We are proud to have supported Greener Journeys in their marketing success, by redesigning their website with the goal of increasing the impact of their campaigns. Norman Baker, former transport minister and Chair of Bus Users UK, presented the gold awards to winners selected from over 270 entries. A publication overview page in desktop view with download features, social media sharing options and related posts. News and Events page in tablet view, with highlighted and latest posts. Since launching the new website, time on site has increased by 20%, with visitors spending significantly more time exploring and reading content on the website. The site received it's highest peak of traffic in 2015 when we launched the site, and visitors have continued to spend more time on site with every visit. The site immediately saw a jump in organic traffic after we launched the new responsive website. The cleaner navigational structure meant that the site was crawled much more easily by Google and organic search engine rankings grew rapidly.